Before getting started improving things, let’s gain a basic understanding of how Google determines which Google Places results to show and at what times. Google Places uses proximity, relevance, and reputation or ranking for determining how Google Places results are ranked. Google Places results have been increasing on Google Search results pages in the 3, 6 and 9-pack versions, but these results are subject to change because Google is always trying new things. Google has noticed a massive increase in customers on a mobile phones either on Google Maps, Google.com or Google Places, looking for certain places. Because in this fundamental shift in the way customers are searching Google, they are making changes and adding new advertising mechanisms, like Google Boost and Google Tags. Proximity is determined by your location or the city, state combination you enter as your search. For example, great burgers in baltimore, ma, but you live in St Louis, MO, so instead of defaulting to St Louis, Google switches and pulls results from the center of the city of Baltimore. Relevence is one of the factors in determining the placement of your Google Places Page results. Relevance of content needs to be a major focus for anyone seeking good results. For Example, if you are a merchant of a Chinese restaurant called Foo Wongs, be sure to use Foo Wongs as your name. It's tempting to add Chinese Food to the end of Foo Wongs, but do not since that could hurt the relevance of your Google Places account. Most people will not know Foo Wongs and will be looking for a genre like Chinese Food, but Google are the kings at context, so there is nothing to be concerned about when it comes to your business name. The mobile tools are setup to compare the results via keyword or genre or even entree item so, again, Google's got contextual search covered. In fact, we are reminded via a tweet from BBHLabs during the Marissa Mayer Speech, "the future of local is contextual discovery." Google's Marissa Mayer argues 'where' is exceptionally valuable for any type of search. #SXSW . Reputation is the third major part of what Google uses to determine order of results for Google Place results. Based on my testing, it's simular to the algorithm Google uses to rank websites. Your reputation is based on inbound links, likes, shares, NAP, citations, reviews, Google pluses, and mentions on other websites. It's helpful , if you are a restaurant, to be setup within the restaurant apps like yelp.com, opentable.com, and foodspotting.com, since the data flows via microformat to Google Places. Hotels need to be setup on travel sites, and so on. 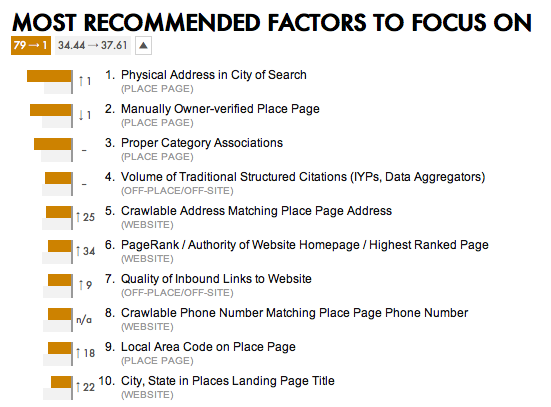 Other factors that can help rankings. Frequency of updates - There are many best practices about running a website, but one often overlooked technique is timing and frequency of updates. Look at some of the most popular blogs like Tech Crunch and new posts come frequently. Any successful content strategy can benefit from an increase of relevant content to a Google Places page. For example, as owner of Foo Wongs, have your customers use a food spoting app or even have them tweet a photo of their favorite dish. The most re-tweeted photo is posted to the Google Places photo stream. Make it fun and game-like and people will begin to appreciate the experience. Consistency - Most people in the Google Places community referrer to consistency as NAP, which stands for name, address, and phone number. What it means is make sure your website, external listings about your company and your Google Places page have the same name, address, and phone number, in text, word-for-word, letter-for-letter. Having your company name on your personal website, if you have one, match that with what is on your Google Places page is imperative for good relevance. When the address matches, then even more relevance is added. However, be sure Google can get to your address and it's not an image in your website header, but in the footer as text. Highlight the text on your webpage with your mouse cursor if you are unsure. If your mouse highlights a block, then it's an image, but if you can highlight each letter, one at a time, then it's text. Now you know how to detect if your contact info is in the correct format, it's now time to place it in the most visible spot on your website. Instead of burying your NAP info on your contact page, place it in the footer so it appears on every webpage on your website. Make sure your phone number is also the same as on your website. Google uses these consistency signals to confirm the business is real. Depth of content - Be sure to focus on having some unique content. By using tracking urls to test content, the most popular content results will surface and should be replicated. As owner of Foo Wongs, I include the name of my chef, where I source my ingredients, cooking styles, and post some of my favorite recipes. The only way to determine what works and what does not is to use one of the tracking schemes described in the $9 version of this toolkit in appendix D. Without the help of the toolkit, your only hope is to get creative. Within Google Places, your completion percentage, see image below, is based on completeness of content, not depth. One of the best ways to succeed with offers in Google Places is to perform market research on other areas of the world to see what they’re doing. It’s simple. Open a browser and go to http://www.google.com, if you logged into your Google account and have supplied an address, they will use that as your location. If not logged in, the IP Address of your ISP will be geo-located to determine the zip code location. Change your zip code and see what kind of Chinese food they have at that locale. Examine the best ones and make a list of what they are doing. Ask your employees and upper management constituents how to incorporate to do the same and see what ideas get generated. Just click the change location link on the left side below the list of Google services. Rich Snippets - According to Aaron Schoenberger, of the Brain Child Group, “I’ve noticed Google Places slowly transition from displaying manually entered business information to pulling meta data from business websites.” This meta data that Aaron is referring to is called Rich Snippets by Google or Microformats from by open source leaders who manage the specification. The technology was started by Tantek Çelik, who operates http://microformats.org/ with the help of other microformat pioneers like Chris Messina of Google, Ben Ward of Twitter, and Paul Tarjan of Facebook. Searching for pizza and selecting recipes returns a host of new options of the left side. I can now find only pizza that takes less than 15 minutes to cook or that only includes the ingredient mushrooms. This data is the meta data that Google’s search bot has gotten a keen eye for recently. As Google fine-tunes the results and as more webmasters adopt the microformat standards, pepperoni will be an option. The review micro-format is what I see most of the time in Google’s main search results page. Performing a search for “canon eos rebel t2i” returned the following results. If you look closely, there are a few results in the SERP which include review stars. These sites have added the hReview format to their webpage markup. They have also registered their website here (http://www.google.com/support/webmasters/bin/request.py?contact_type=rich_snippets_feedback) so that Google can send a special bot to examine the micro-format markup. To ensure proper coding of markup people use the Rich Snippets testing tool located here (http://www.google.com/webmasters/tools/richsnippets). There should be no doubt, at this point, for the incredible value which can be derived about the context of website content when they use micro-formats. This is incredible leap forward in making searching return the most relevant results and Google is leading the charge once again. Her argument is that the larger websites, who have focused on SEO and knew that implementing the hRecipe would be huge, are watering down the quality of the food recipes on Google thus making the recipe search a bad recipe search. The quality recipes, which were once prominent on Google, may not be found as quickly or at all using the new recipe search, if they have not implemented the hRecipe micro format. While I can see Amanda’s point, the web never stands still nor do we want it to. That means we need to be open to change, embrace it, and prepare to tackle what it brings. For all of the non-programmers, micro formats are not easy to grasp and can be hard to implement. The awareness Amanda brought to the situation will help further education. Many people in the comments of the food52.com blog make reference to Amanda’s desire to inform and educate. Also in the comments, I read there’s already a word press plug-in for non-programmers who need a hRecipe micro-format solution for their food blogs. Don’t be intimidated by micro-formats. There are many more micro-formats coming and many more essays to be written about how to big guys who adopt micro-formats win early. Google’s quick adoption of micro-formats, and knowing how many more are under development at microformats.org, make me firmly believe in their future for search.